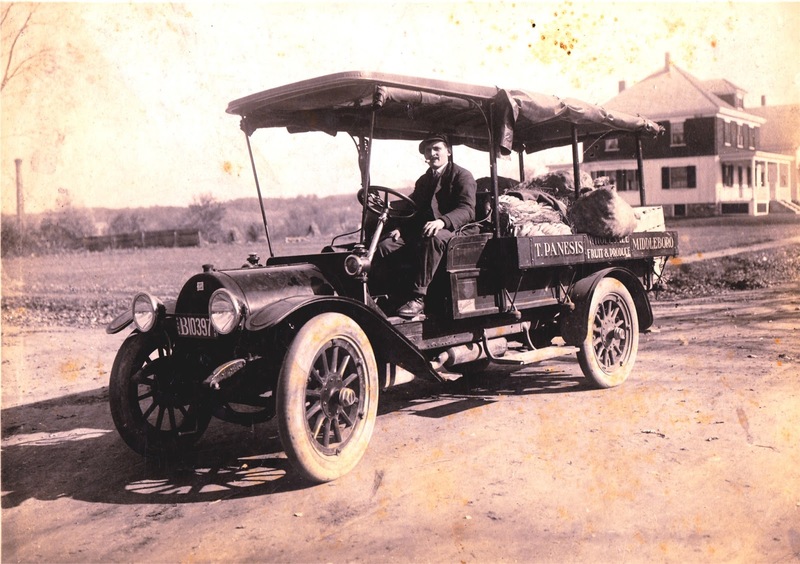 Thomas Panesis in his canopy express truck, circa 1925. As part of the fruit and produce business Panesis conducted in Middleborough, delivery wagons and later trucks were operated. The photo depicts Panesis in what is believed to be the GMC truck he acquired in June 1922. (Four years later, in June 1926, he added a Chevrolet delivery truck). Panesis had poor luck with both the wagons and trucks. In August 1915 his delivery wagon was struck by an auto and in July 1919 Forest... Washburn ran into Panesis' fruit wagon with his motorcycle. In February 1927 Robert E. Nolan's touring car collided with Panesis' truck on Everett Street. The location is the corner of Benton and Webster Streets with 28 Webster Street being noticeable in the background.